Hidden microphones, tableaus of storefronts and a young woman gives us access to the secretive world of Psychics. A hotchpotch of prophecies and predictions, both concurring and contradictory, wash over her and us. This is a film about being lost in the world or yourself. And what can happen when you seek help and answers from others. To be defined is to be erased. A new start. 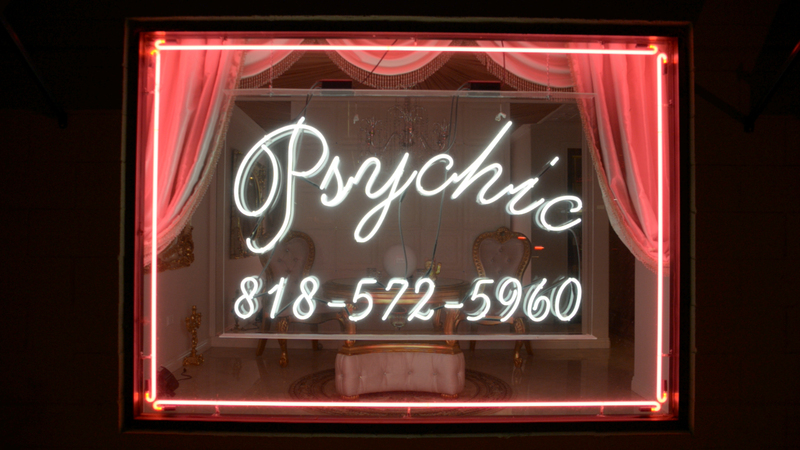 “Psychic” dives into the commonplace phenomena of psychics in the Hollywood area. Littered around town they function as a type of budget therapy. As the average Joe’s psychologist in a country where professional guidance comes at a steep price they fill a definite purpose for the people that go there. Frequently frowned upon what can come across as naivety or a cry for help also presents an intriguing game between reader and read. Hints in a character or clues given from the subjects life are interpreted and spun into prophecies and life guidance. Considering this, isn’t it true that knowledge can be gained and possibilities discovered in the limited predictions of the psychics? The film aims to paint an artistic portrait of the world of psychics and the guidance they offer. What are the driving forces and implications for the people who seeks them out? How does this mysterious and serious game where you can gain knowledge in unexpected ways unfold. The visual language of the film is dominated by tableaus of psychic storefronts aiming to illustrate a secretive world or a container of something unknown. These are accompanied by predictions recorded with a hidden microphone at real sessions. The predictions of the psychics creates a weave which drives the story forward and develops our impression both of them as an phenomenon and the young woman being read. There’s a secondary visual layer comprised of imagery of the young woman in off-beat everyday situations loosely correlating with the predictions. A sort of aimless wanderer she’s outside the frame of reality but trying to connect. The more she is described, the more absurd the situations gets which also underlines the slightly comic air of far-fetched or contradictory predictions. To someone who has worked for a long time within the documentary circuit Tova Mozard represents a breath of fresh air. Coming from a solid background within the art world she enters the documentary realm free of preconceptions about storytelling or the unwritten rules of the genre. Arguably this could result in experimental or non-narrative films with a very narrow audience appeal. In Tova’s creative universe the end result however is very far from that. As she has shown with both “The Big Scene” and “Cops are Actors” her films has the ability to hit a chord with both the art world and the general documentary audience. Tova accomplishes this by exploring the thin line between reality and make-believe in a way that engages the viewer in her stories. She’s got an uncanny eye for characters and scenes which exists right at the border of our everyday life but has a definite surreal air to them. A quality which also lends a very personal comedic edge with a looming seriousness to her films which keeps the audience on their toes. With her new film “Psychic” Tova is set to take a big next step in her filmmaking. With her phenomenal photography skills as a base she will dive deep into the collective human mind. By putting herself in the vulnerable position as a person seeking answers which might not be there she will address universal feelings we all can relate to and sympathise with.